The Central Florida Employment Council hosted the annual Mayor’s Job Fair on Jan. 30, 2019 at the Central Florida Fair and Expo Park. The event, now in its 18th year, brings together hundreds of job seekers and more than 100 employers and staffing agencies for an afternoon of networking and interviews. Orange County Mayor Jerry Demings provided the opening remarks and interacted with employers and those on the job hunt. Attendees had the opportunity for one-on-one conversations with employers seeking to fill vacancies in the hospitality, healthcare, transportation, customer service, education, construction, skilled trade, government and business service sectors. There were also opportunities to network with potential employers, including various divisions and offices within Orange County Government. Earlier this month, the Florida Department of Economic Opportunity reported a 2.9 percent unemployment rate for Orange County’s metropolitan statistical area in December 2018. Just last week, the region took the No. 7 spot in the Milken Institute’s Best-Performing Cities index for a second consecutive year, reflecting the region’s robust and prosperous economy. Citing areas where jobs are created and sustained, the report released on Jan. 24 included metrics on job growth, salaries and technology output. The rankings help policymakers, investors and companies understand where local economies are thriving. With the region hosting 72 million guests in 2017 — the eighth year in a row as the nation’s No. 1 travel destination — tourism and hospitality continue to be critical industry sectors in Orange County, generating $70 billion dollars in economic impact and supporting roughly one in three jobs. 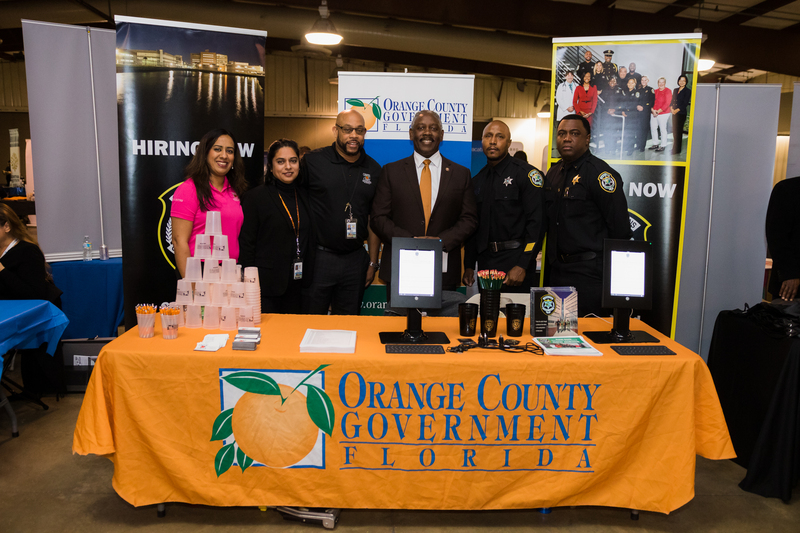 Photo Caption: Mayor Jerry L. Demings spends the morning at the Orange County Government booth with County staff at the Mayor’s Job Fair on Jan. 30, 2019 at the Central Florida Fair and Expo Park.